The Geo F Trumper Sandalwood fragrance was released in 2002 to honor Queen Elizabeth's Golden Jubilee. It has notes of bergamot, lemon, lavender, clary sage and spice notes, white jasmine, carnation, geranium and rose, sandal, patchouli, amber, vanilla and a hint of leather. This is a very nicely done, slightly sweet sandalwood, very smooth and creamy. It has light floral undertones, and the subdued notes of patchouli and amber give it a nice depth and warmth. It is by no means a girly scent, but nor is it overwhelmingly masculine. Very much worth a try for sandalwood lovers, especially those that are patchouli fans as well. Ajaccio Violets starts out a out a lovely, light but sweet violet with a woody undertone. It gets darker and less sweet as it dries down, and starts to take on some of the earthy, almost musty edge that I also find in Caron Violette Precieuse, Berdoues Violettes de Toulouse and i Profumi di Firenze Violetta di Bosco. Again, this could easily qualify as a unisex scent, and it is very much worth a try for violet lovers. 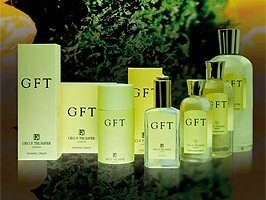 My personal favorite out of the scents I tried was GFT, created to celebrate Trumper’s 125th anniversary. It is described as "an invigorating and refreshing versatile cologne with top notes of mandarin, bergamot and lemon, a heart of tarragon, lavender and cypress on a light musk-like base with notes of cedar and moss". The top notes are a little sharp, but it calms to a really nice, light, summery citrus with woody undertones. The tarragon gives this some oomph without being at all overwhelming, and the cypress is just lovely. The closest thing I can think of to compare it to is Annick Goutal Eau d'Hadrien, but the GFT is longer lasting and I find it more interesting. This may be joining my collection soon. If you want to learn more about the Trumper line, there is a very nice article on the basenotes site written by someone who worked in their London shop for some years. For purchasing information, see the listing for Geo. F. Trumper under Perfume Houses. Hi R!! My DH likes some fragrances from Trumper – must ask him which ones. I am not such a fan – like Floris (my DH is a great fan for years) but I have not found any I adore. I like your descriptions – I would like to try Ajaccio Violets. Thanks N! I like the Ajaccio Violets, but I am still searching for the perfect violet scent. Nothing ever captures the smell I remember. My favourite violet is Bois de Violette because of the woody notes and not too sweet. Some violet fragrances can give me headaches. Hope you find the HG of violets soooon! Robin, dear…where is a good place to order some Trumper samples? I'd really like to try these. Tried one long ago and liked it…a men's scent…can't remember which it was. H, sadly, I have no idea! I swapped for mine. They were all carded, so I assume Trumper makes samples available one way or another. Maybe email them to ask? Their website seems friendlier & less snobby than most if you know what I mean. You could also try fourseasonsproducts, but they seem to have a pretty limited number of scents from the line. I totally agree with you about GFT. I received a sample from somewhere and fell in love with it. I found it to be a wonderful citrus scent with a terrific woodsy herbal drydown. I have tried Eau d'Hadrien but much prefer GFT. Some of these are available for purchase on EBay, though I am not sure how the price compares with ordering from the website. Glad it has another fan. I have checked ebay, no luck on a deal so far but I am going to keep looking! Have you tried any of the Taylor Of Old Bond Street colognes? They are half the price, just as high quality (if not higher) and smell absolutely wonderful. Their gentleman's cologne quite frankly embarrasses the likes of Pour Monsieur by Chanel and its ilk. I recently tried Cologne Sologne (spelling?) by Parfums de Nicolai which is also wonderful, but it will be the Taylor of Old Bond St which I will be buying next. Fresh, spicy and very very elegant. I don't think I've ever even seen them, so no! I'll have to look around. Wow, I think this stuff is crap. Mr. Trumper does not seem to have any Q.C.